When is a kilt just a skirt? skirt /skəːt/ 1. A woman’s garment fastened around the waist and hanging down around the legs. Although we Americans like to consider ourselves fashionably progressive, with our opinions printed on t-shirts and gimmicky nail-stickers that boast our political party, only a handful of men today would dare to get up in the morning and choose a skirt as their bottom piece. Similarly, most American men would not be caught dead wearing a dress, as it is nothing but a skirt with a top attached to it. So while we may think we have come far, we can’t celebrate yet. This Spring 2012 fashion season, skirts have wrapped their way into countless designer’s menswear collections. 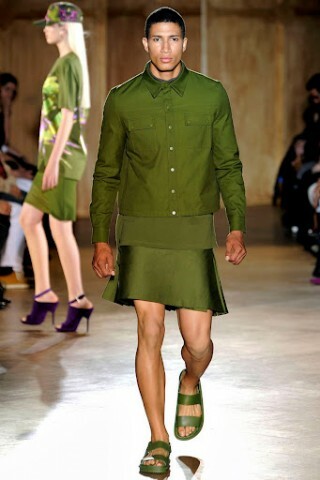 While this is a first step into the skirt becoming a regular clothing choice for men, we still have a long way to go. 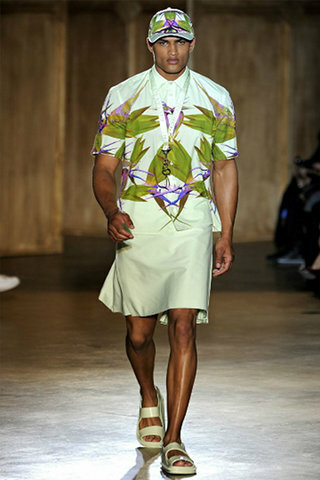 Givenchy’s Spring 2012 men’s collection features moss green, forest green and crisp white outfits with the bird of paradise flower pattered across select pieces. While the exclusivity of couture is immediately reinforced by these items prohibitively high price, why hasn’t the average man worn any ol’ skirt in the first place? That is, besides the die-hard death metal band members or run-of the mill New York yuppies. Both of which you wouldn’t be caught dead even smirking at. 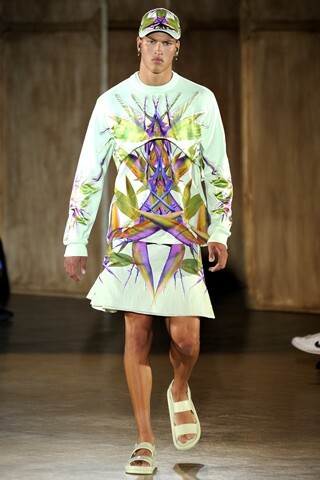 When observing the skirts in Givenchy’s 2012 collection, the male models do not look like “men in skirts” but rather men in couture. In fact, the men appear not only avant-garde but also privileged. The bird of paradise motif and casual baseball cap only reinforces the elite and undemocratic feel of the outfit. Fabric density and the tightness of a skirt either emphasize the body or erase it. The skirt at its most basic design is a cylindrical form with an opening at both ends. Once the wearer steps into the skirt, the top gap is plugged with the hips of the wearer. The reason why it works for this model is as the cylinder shrinks to the wearers body, as is seen in pencil skirts or bandage skirts, the more feminine the skirt becomes. Here, on the other hand, the skirt acts more as a loose but straight edged wrap. The skirt’s open form has become historically feminine in European countries. In the 1930s and 1940s, “skirt” was a derogatory name for a “sexually attractive woman”, and this crude and sexist use still pops up now and then decades later. Bound by societal constraints, skirts were the only choice for a 19th century European woman. Men did not have the leisure to wear a skirt, but more importantly, society wasn’t pressuring them to stay strapped into burdensome, layered skirts. As the bread winners, men required practical wear such as pants and work shirt to allow them to move freely. This phenomenon is also visible significantly further back in history. In ancient Egyptian times, both Egyptian common workers and slaves wore loincloths made of animal hide, while the rest of society wore wrap around skirts. Only the Pharaohs and hierarchy wore wrap skirts on a daily basis. Skirts are hardly convenient for everyday use. Right after the flower power decade In the 1970’s, Electric Engineer David Hall made himself known as a “pioneer” in fashion . Hall was not gay nor a crossdresser and he wore a skirt daily despite his wife’s disapproval. Hall felt that “women wearing pants and men wearing skirts is equality of the sexes”. This certainly poses the question as to why women may wear pants and yet men are not socially “allowed” to wear skirts. Hall theorizes that in American society it is socially acceptable for the woman to copy the man because he is considered superior. Men cannot copy women because they are “beneath men” and that would lower their status. The average woman wears pants considerably more often than skirts. Therefore, who is to assume that men will catch on? Psychologist Knight Dunlap says that “which kinds of clothes happen to be seen on the streets in any decade depends on the strength of forces that favor personal display or concealment”. For example, wearing a skirt in this decade in America, is not socially appropriate no matter what the style or shape. Maybe America isn’t ready for fashion revolutionaries such as Jean Paul Gaultier. Once the form of a fabric transcends gender, hold the applause. Hoorah for the fashion trend but these styles still try to feminize the look of a man and most men will not jump on the band wagon to perpetuate the movement for men’s fashion freedom if it puts them in a position to be labeled as anything other than a “normal” man. These designers would serve our socially strangled gender better if they would introduce skirts that go with our current wardrobe. How about eliminating the legs separation in a good ol’ pair of western cut Levis or any style of men’s slacks for that matter?? Why can’t they modify what we as men and society are accustomed to satisfy the comfort and fashion freedom men seek without completely changing everything? Men don’t want to dress like women and be considered deviants; they want to merge “unnoticed” in to the same world of comfort and fashion freedom that women enjoy. Of course we must remember that women fought hard in the past for the very same freedoms that we as men want today, so don’t expect it to come too easily. Be a man, choose your wardrobe wisely and step up and step out or we will never evolve.